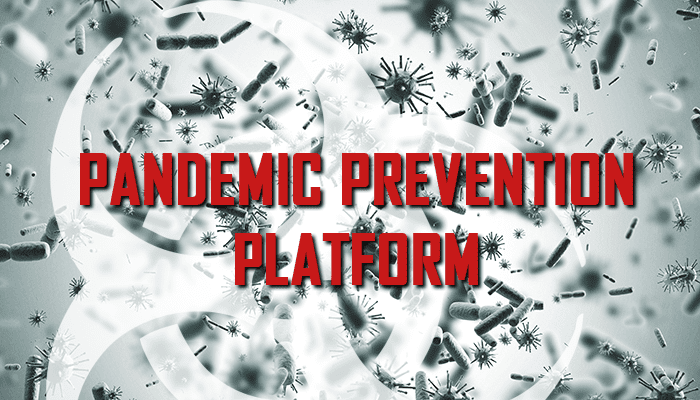 The Defense Advanced Research Projects Agency (DARPA) launched the Pandemic Prevention Platform (P3) program in 2017, with the eventual goal of halting the spread of any infectious disease outbreak before it can escalate into a pandemic. Current approaches for recent public health emergencies due to infectious diseases have not produced effective preventive or therapeutic solutions in a relevant timescale. Examples from recent outbreaks such as H3N2 (flu), Ebola, and Zika viruses highlight the significant lag in deployment and efficacy of life-saving solutions. In contrast with state-of-the-art medical countermeasures, which typically take many months or even years to develop, produce, distribute, and administer, the envisioned P3 platform would cut response time to weeks and stay within the window of relevance for containing an outbreak. Over the past several years, DARPA-funded researchers have pioneered RNA vaccine technology, a medical countermeasure against infectious diseases that uses coded genetic constructs to stimulate production of viral proteins in the body, which in turn can trigger a protective antibody response. As a follow-on effort, DARPA funded research into genetic constructs that can directly stimulate production of antibodies in the body. The P3 program aims to build this foundational work into an entire system capable of halting the spread of any viral disease outbreak within 60 days. This last weekend, at the AAAS Annual Meeting in Austin, Texas, Col. Matthew Hepburn, M.D., the program manager for P3, announced that all performer institutions are now on contract and moving forward with the program’s goals. The nucleic-acid-based technologies that are central to P3 research, particularly those focused on DNA and RNA, include some developed under DARPA’s Autonomous Diagnostics to Enable Prevention and Therapeutics (ADEPT) program. 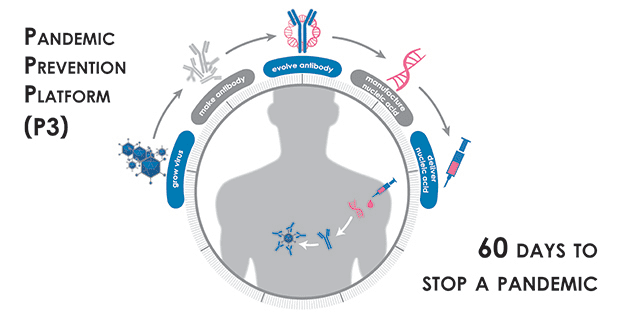 Through these tools, researchers can identify protective antibodies from recovering patients and then manufacture genetic constructs capable of instructing a patient’s body to produce similar protective antibodies. Significant quantities of these nucleic acid “blueprints” can be rapidly manufactured compared to existing antibody production methods. P3 performers are expected to demonstrate safety of their nucleic acid product against one target pathogen in a phase I clinical trial. Ultimately, the performer teams will be evaluated on the results of their clinical trial and their ability to complete the end-to-end process within 60 days from the time the pathogen-containing sample is first obtained. Also, to demonstrate the broad utility of the platform, each team will target a variety of viral pathogens including influenza, chikungunya, MERS-CoV, and Mayaro virus, among others. Under the program, P3 performer teams are developing technologies for an end-to-end pandemic response platform that includes the ability to study viruses for downstream antibody discovery and final evaluation and testing of candidate therapeutic products. Teams will demonstrate the ability to rapidly discover and optimize antibodies so that they are most effective against an infectious agent. Further, the P3 teams are tasked with developing technologies to deliver antibodies using nucleic acid technology, and achieve sufficient serum concentrations of the antibodies for protection against the pathogen within three days after administration. For more information on the P3 program, please visit: http://www.darpa.mil/program/pandemic-prevention-platform.